There were 2 games involving New York Ranger and New York Islander prospects on Monday night but they shared a common theme as teams playing with fire found themselves burnt and lost. These were games that the losing team should have won but didn't and if they lose their playoff series they will only have themselves to blame. First in Kootenay it was Game 3 between Adam Tambellini's (NYR 2013 3rd) Calgary Hitmen and Mackenzie Skapski's (NYR 2013 6th) Kootenay Ice. The Ice had worked hard to steal game 1 and if they had held home ice could have kept the home ice advantage but they gave it back to Calgary dropping a 7-6 decision at 5:05 of the first overtime. Calgary takes a 2-1 lead in the series and Kootenay has only themselves to blame. Mackenzie Skapski played a terrible game and it wasn't because he gave up 7 goals but rather the kinds of goals that he let in. Yes one can make a case that Skapski got no support from his teammates but he has to make some saves to help bail his team out. In the first period the game was all of 3:22 old when Tambellini found Landon Welykholowa on the other side of the crease for an easy goal and a 1-0 Calgary lead. Kootenay would tie the score on the first of 5 power play goals (Calgary's discipline was horrible as was their penalty kill). In the 2nd period, Skapski would give up a goal on Calgary's 1st shot of the period just 2:15 into the period as once again Tambellini would set up Welykholowa for the rookie's 2nd goal of the game and 4th goal in just 2 games. Kootenay would tie the game at 3:46 on their 2nd power play goal but Tambellini would score his 2nd goal of the playoffs 57 seconds later at 4:43 to give Calgary the lead yet again. For Tambellini it gave him back to back 3 point games and the Hitmen would hold onto the lead until Kootenay would tie it up on their 3rd power play goal at 13:29. The tie did not even last a minute as Calgary would score 41 seconds later at 14:10 on an unassisted goal. Skapski would get yanked after allowing 4 goals on 18 shots. Kootenay would respond to the benching by tying the game on what would turn out to be their only even strength goal of the game. The Ice would then take the lead at 5-4 at 19:47 of the second period and took that lead into the 2nd intermission. In a surprising move, Skapski was back in goal to start the 3rd period and then gave up a bad goal off a wrister just from inside the blueline. He should have stopped that shot as Calgary would tie the game at 5-5 at the 5:17 mark. Kootenay would take the lead once again on their 5th power play goal at 11:23 but Skapski simply couldn't make a key save in this one and Calgary would tie the game just 37 seconds later at 12:00. The game went to overtime and Calgary would earn the win with a goal at the 5:05 mark. Tambellini finished with his 1-2-3 +3 but all of his damage was early in the game and you could get the sense that Calgary was not going to use him in defensive situations. Skapski was (no other way to say this) just terrible giving up the 7 goals on 28 shots. With Kootenay shorthanded on defense then Skapski has to play better as they wasted a night with 5 power play goals and no way should you lose when you score than many power play goals. Tambellini is 2-5-7 after 3 games and Skapski is 1-1-1 with a 4.69 goals against and a 0.843 save percentage. Both teams are right back at it on Tuesday in game 4. In Saginaw, Adam Pelech (NYI 2012 3rd) and Troy Donnay (NYR 2013 UFA) along with their Erie Otter teammates left their defensive game on the bus as they dropped game 3 of their series to Jesse Graham (NYI 2012 6th) and his Saginaw Spirit 7-6 in overtime. The Otters should be happy that they lead this series 2-1 after this loss as they have done their best to try to give away this series to Saginaw. This game was pond hockey to say the least as the first goal was scored just 1:00 minute into the game and Saginaw would take a 2-1 lead after 1 period. In the second period the Otters would out score Saginaw 4-2 to take a 5-4 lead after two periods. Adam Pelech would score his 2nd goal of the playoffs which was Erie's 5th goal of the game and at the time made it a 5-3 game. In the 3rd, Saginaw would score to tie the game at 5-5 at the 5:42 and take the lead at 6-5 at 14:27. Erie would force overtime when they scored the tying goal with just 33 seconds left in regulation but that just postponed a Saginaw win. Erie has a lot of work to do between now and Wednesday when game 4 takes place. Erie's defense has been terrible and Saginaw which has several experience playoff players on their roster who will make them pay for it. Adam Pelech was 1-0-1 while Donnay was scoreless and Graham was scoreless for Saginaw. The Western Hockey League announced today that Brandon Wheat Kings’ defenceman Ryan Pulock is the Denny’s WHL Player of the Week for the week ending March 23, 2014. 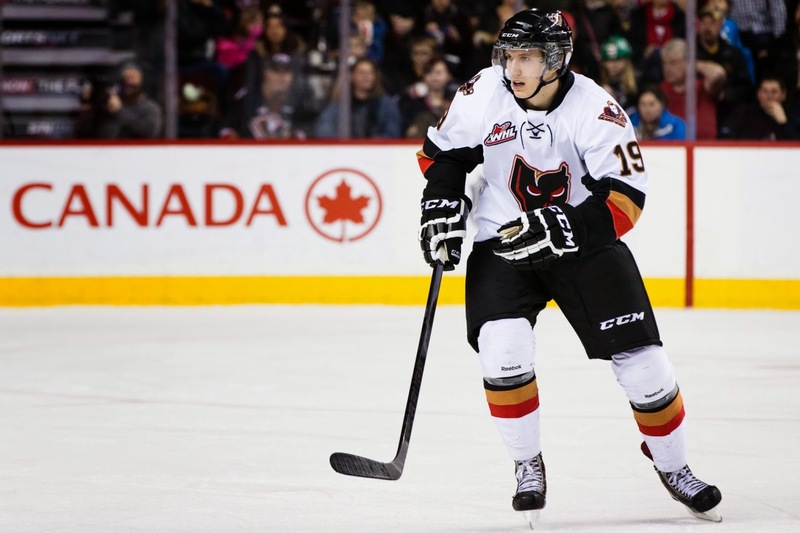 It’s the second Denny’s WHL Player of the Week award of the season for Pulock. Pulock scored two goals and four points to go with a +5 rating in two road games on the weekend, helping the Wheat Kings take a 2-0 lead over the Regina Pats in their Eastern Conference first-round playoff series. On Saturday, March 22, Pulock tallied a goal and an assist while being named the game’s 1st Star in a 6-3 victory over the Pats in Game 1 of their series in Regina, SK. On Sunday, March 23, Pulock scored again and set up another for his second straight two-point outing, and was named the game’s 3rd Star in an 8-4 triumph in Regina, giving the Wheat Kings a 2-0 series lead. Pulock, a 19-year-old from Grandview, MB, is in his fourth season in the WHL with the Wheat Kings, and finished second on the team in regular-season scoring with 63 points in 66 games. 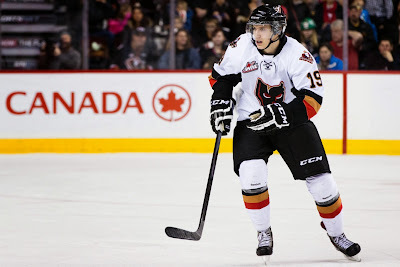 The Wheat Kings’ seventh-round pick, 136th overall, in the 2009 WHL Bantam Draft, Pulock has played 261 career regular-season contests while amassing 210 points, including a franchise-record 64 goals. Pulock was drafted in the first round, 15th overall, by the New York Islanders in the 2013 NHL Draft. Here is a link to the video they did on Pulock and if you are a Ranger fan you won't like it.